There are certain variables that always have to be weighed up when purchasing a laptop. It's almost like getting a rescue cat. You could go for the feisty looking one, with shining eyes and claws to match, knowing you'll never be able to let it out of your house because it'll bring countless bleeding rodents indoors. This is the desktop replacement cat, if you hadn't quite caught our metaphor. Just as appealing an option, if you're after an easier but less exciting life, is a tiny kitten, easily pocketable for transportation but without the skill set of a full-sized cat. Fujitsu Siemens' latest machine fits the kitten metaphor quite well. It's undeniably small, it's easy to carry around, and the Core Solo inside means its muscularity, as it were, is limited. 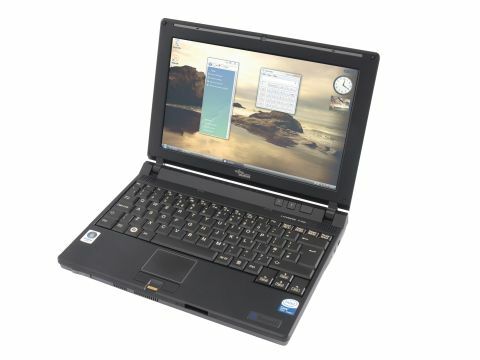 Heck, the P7230 even has an inexplicable furry underside, so you can stroke it if you're feeling lonely. But animal comparisons don't quite show the whole beauty of this little machine. For a start, and we know there are those that will argue, this is simply the correct size, and the weight is spot-on too. A notebook PC is meant for movement, despite what desktop replacement sales may be telling you. A notebook should have enough resilience to be flung into a bag with reckless abandon, and enough juice to work for an hour when pulled out in an emergency. And, ideally, a notebook will have heart-stopping style to go with it. The Lifebook has ticked most of the above boxes. It's relatively sturdy, although there's some definite give when pressing the case firmly with thumbs. It's definitely diminutive, although the optical drive crammed into the machine's right side has no doubt pushed the thickness up by a couple of millimetres. And it's competent at handling battery power, too, charging quickly and lasting well over three hours in our tests. But as for style, well, it's a personal thing, but we were always of the opinion that the quicker companies stop aping IBM's impersonal Thinkpad design, the better. The angular appearance of this Lifebook doesn't exactly redress the balance - it's like a Thinkpad Lite - but it does raise certain stylistic points. Number one is that black has swiped away all that silvery competition, and regained its place as 'most stylish PC colour'. Even a case as chunky as this one, when presented in gorgeous matt black, exudes much more value and class than a cheap silvery equivalent. Point two is that any PC, when shrunk down to airplane tray-table size, becomes brilliant by default. There are plenty of neat touches stashed away in the Lifebook P7230 too. The PCMCIA slot is ejected by pushing a small slide switch on the front of the machine, neatly avoiding the eminently snappable buttons which usually grace laptops. A tiny improvement perhaps, but one which speaks directly to our unfortunate habit of breaking such things. There are only a couple of USB ports, but they've been separated, with one on each side of the machine. Clever. And the paranoid amongst you will be more than grateful for the inclusion of a fingerprint reader between the buttons of the touchpad. Portability is further enhanced by a built-in SIM slot, allowing new-fangled 3G communication while on the move. This will only work if you have a subscription with a conducive supplier, but it's a nice touch nonetheless. There's even an accelerometer in there, MacBook style, so that your hard drive can be saved if you drop the machine. If you've read this far, you know what we're about to say. The performance of the P7230 isn't really up to scratch, but the level of performance you can expect from such a miniature system isn't high. If you compare this to systems from a similar size bracket, it doesn't fare too badly. It's furlongs ahead of UMPCs and, with the exception of certain machines from Sony and Samsung, pretty high up the list of ultra-portables. It has its issues, though. It gets remarkably hot when switched on, because airflow is so restricted by the amount of components inside. That minimal space also tightens up airflow, meaning a consistently warm and all-too-audible blast emits from the exhaust port on the left. But if you're in the market for a notebook, and this happens to hit your price point, it's a perfectly sound little PC. It even manages a passable - if sluggish - stab at running Vista. But if you can stump up a sliver more cash, then look at Sony and Samsung's line of ultra-portables: they're the cute fluffy kitten to Fujitsu Siemens' scraggly scrapper, and you'll love them just that little bit more.